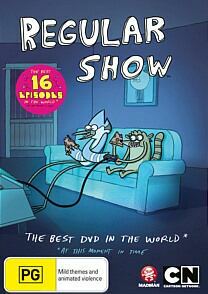 Regular Show - The Best DVD in the World DVD Review If you’re a fan of adult oriented animation along the lines of the [Adult Swim] line up you’ll find a lot of enjoyment by setting foot into the world of Mordecai and Rigby. 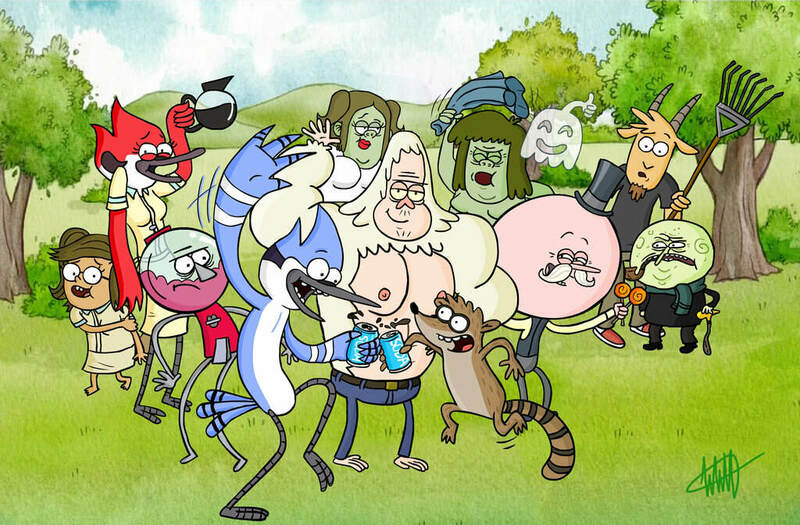 Although airing on Cartoon Network proper, Regular Show shares more in common with the fare aired on CN’s twisted offshoot [Adult Swim] than the children’s programming such as Ben 10 that dominate the channel. 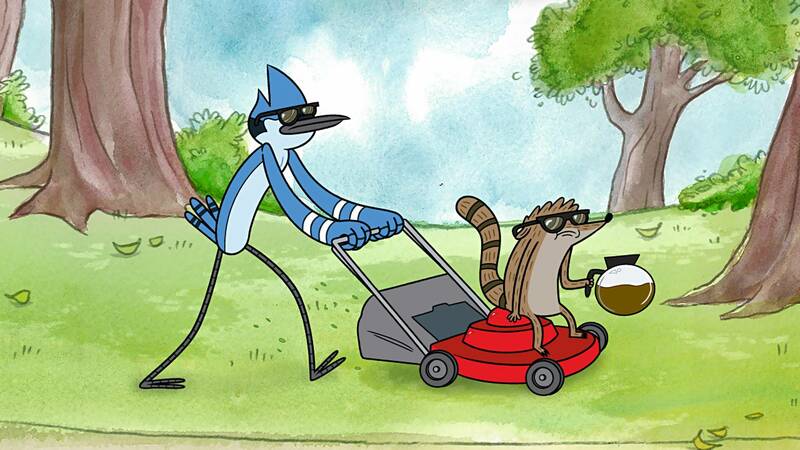 Focusing on an anthropomorphic Blue Jay named Mordecai and his flatmate, a Racoon named Rigby, Regular Show is a mishmash of pop culture references and Non sequitur plotlines that start off as traditional sitcom set ups before quickly nosediving into insanity throughout an episode’s eleven minute running time. The basic premise of the show follows the pair as they navigate bachelor life and whittle away their days attempting to avoid working at their job as groundskeepers for the local park alongside their boss Benson, a gumball machine, a Yeti named Skips and their rivals Hi-Five Ghost and Muscle Man, a corpulent and obnoxious green man. As you’ve probably discerned, surrealism plays a big part in the world of Regular Show, with many of the bizarre characters reminiscent of those in the British sitcom The Mighty Boosh; for the most part this approach works, although at times it can feel like the show is trying too hard to be offbeat and quirky. Throughout this collection, comprised of 16 episodes selected from seasons 1 & 2, the slacker duo find themselves defending their friend Pops, the owner of the park, after he’s humiliated in a rap battle, square off against Muscle Man in a basketball game to determine who will get unlimited access to the shared computer, attain a heightened state of intellect which distorts their perception of reality and assist Muscle Man in fulfilling his trucker father’s final wishes. The animation is unique and accomplished and the short running time of each episode complements the bizarre nature of the plots by ensuring that they don’t overstay their welcome. The show is littered with throwbacks to the 80’s and 90’s, particularly the synth heavy music and anachronistic gaming devices present throughout the show, and the characters are likeable and well rounded, particularly for animation. The only gripe I really have with the show is that some of the voices can be a tad generic; by this I mean that certain voices are interchangeable with other programs – For example Skips sounds identical to Dr. Girlfriend from The Venture Bros, and another character sounds extremely similar to Billy Quizboy from the same show. Aside from some employee profiles this release features no supplemental extras and the profiles themselves amount to little more than a snippet of underwhelming text pertaining to the characters. If you’re a fan of adult oriented animation along the lines of the [Adult Swim] line up you’ll find a lot of enjoyment by setting foot into the world of Mordecai and Rigby. Despite ostensibly being aimed at children, the show is smartly crafted and appeals to the big kid inside of all of us. The pop culture references and licensed soundtrack featuring bands like Filter are clearly designed to appeal to a wider demographic than most of Cartoon Network’s offerings and Regular Show proves that a cartoon doesn’t have to resort to puerile shock tactics to attract an adult audience. Regular Show... It’s anything but.